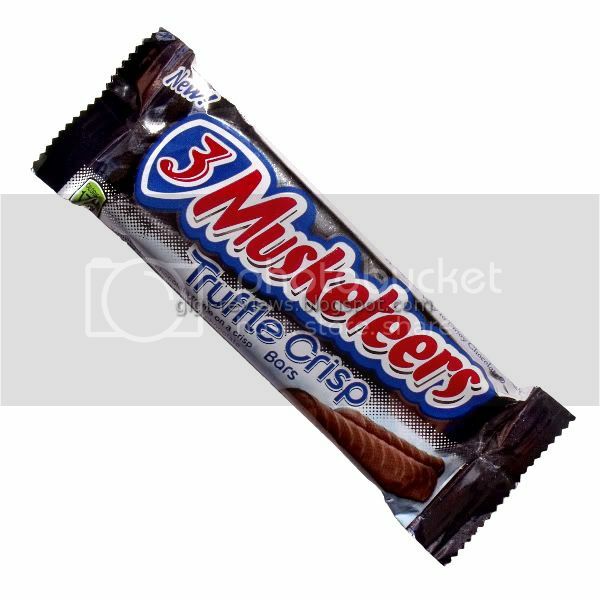 It may or may not surprise you to know that I actually am a really big fan of 3 Musketeers bars. I like the regular bars and I like the mint bars. I like the filling, the texture. I even like the chocolate. I know that these new 3 musketeers Truffle Crisps have been around since at least the start of the year, but I've only found them in my local stores in the last month. The two-finger bars are milk chocolate covered with a truffle filling (which is supposed to be like the nougat center of a traditional 3 Musketeers), and sit on a crispy plank. 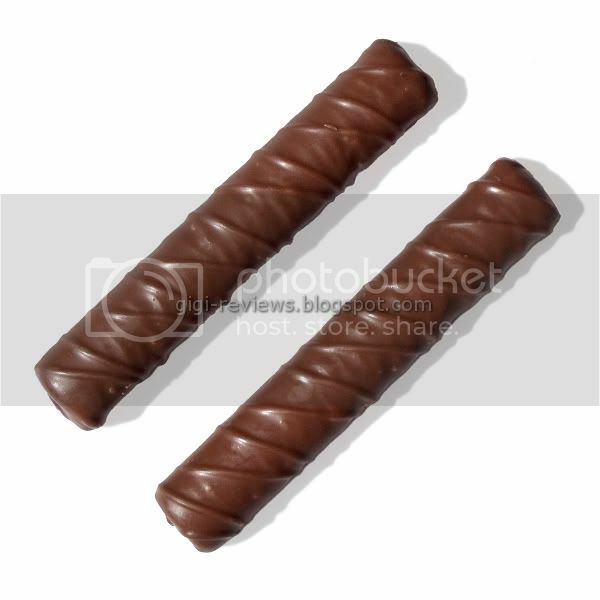 Hmmmm...gee, they look a lot like the Fling bars, also made by Mars, don't they? Unlike their Fling cousins, these bars don't have an iridescent sheen -- but they do have a smooth, creamy looking exterior. The outer chocolate is the sweet, milky Mars milk chocolate that you find on all of their products. The truffle center has a very smooth, mousse-like texture. It's cool on the tongue. 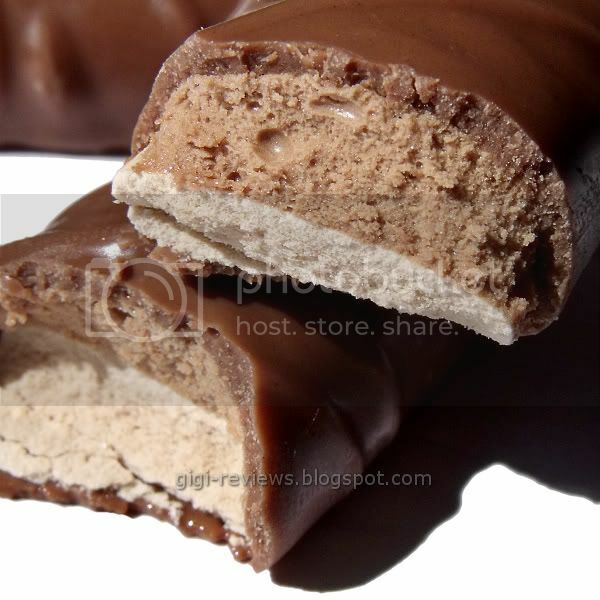 It does -- sort of -- taste like the classic bar's nougat center, but in the loosest possible sense. To me it tasted more like a smooth combination of marshmallows and caramel. It's not a bad taste. In fact, I liked it. And as long as you don't go in expecting the filling to taste exactly like the classic bar's center, you probably won't be disappointed either. My favorite part of the bar is that the crispy plank beneath the truffle is indeed the meringue base that is used in the Fling bars. I loved it there, and I love it here. It's crispy and airy. There's a slight vanilla hint. There is nothing I don't like about it...except that I want more. I really enjoyed this addition to the 3 Musketeers line. It's not a clone of its larger, parent version, but that's perfectly OK. It's more than good enough to stand on its own. The bar is being advertised as a lighter option for fans of the classic. It does indeed have 90 less calories, and it is also lower in sugar and sodium (although it does have a single gram more fat). Honestly, I think that since candy should be a sometimes food (I don't always practice what I preach, clearly), you should choose a candy because you like it -- not because it saves you a few calories. What's the point of pinching a few calories if you don't like or aren't satisfied by what you did eat? I think that this bar is probably the best of both possible worlds. Check out Foodette Reviews' take on this bar here. 170 Per 2 finger serving. Or 85 calories per finger. May contain peanuts, tree nuts and wheat. Dairy. Kosher. I just ate one of the Dark Flings that I found while cleaning out my desk drawer. It'd been a while since I had them. They're quite sweet but I enjoy the mix of textures - the crispiness of the meringue is unlike anything else in candy bars these days. the first time i tried these truffle bars i loved them (sample at sams club)...a few weeks later i finally found them in a local store and bought 3 packs..and after eating a full pack (2 bars), i realized i must have just been really hungry that first time i had them - they weren't as good as i remembered...now i wouldn't eat them again..